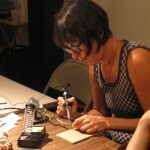 Mz Baltazar’s Laboratory at Harvestworks (New York City) from Stefanie Wuschitz on Vimeo. This free workshop took place in NYC and was organized by Lesley Flanigan and Stefanie Wuschitz. 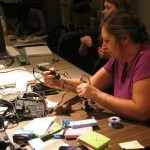 We used Open Source Tools as Arduino, Processing, PD, DIY sensors and found materials. For three days all participants collaborated on project prototypes, creating an intense environment for learning and sharing skills. The video material was shot by Stefanie Wuschitz, Lesley Flanigan edited the video.